Nearby Loch Insh offers an excellent range of water sports opportunities including canoeing, sailing, windsurfing and fishing. Sporting facilities in the area include a number of 18 hole golf courses, excellent salmon and trout fishing on the River Spey and other waters. A wide variety of birds can be seen from the RSPB hide overlooking the flood plains of the nearby Insh Marshes and within easy reach are the Cairngorm Mountains for snow sports and hill walking. www.lochinsh.co.uk Outdoor Centre which is open to the public, restaurant, bar and shop, off licence on site. www.macdonaldhotels.co.uk/our-hotels/macdonald-aviemore-resort – Cinema times, Swimming, Fun Factory, Softplay, Gym, Spa. www.highlandwildlifepark.org – meet wolves and tigers !! 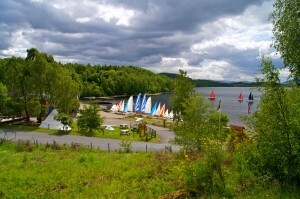 visitcairngorms.com – loads of things to do too many to list! About 85 providers from shooting to painting. Walking to gliding. www.g2outdoor.co.uk 01540 651784 Zip line park, white water rafting and more. Traditional Scottish Hotel- serves a great choice of food, great for all the family. Bar serves local beers and has nightly entertainment. The Old Bridge Inn. Aviemore. Delicious local cuisine, best for adults. Bar with a great atmosphere and bands. Delicious homemade food from the estate served in cafe and a farm shop onsite at the visitor centre. Serves local brasserie throughout the day, very popular. Extreemly popular Italian restaurant. Booking recommended. Family friendly. Take away also available. Serves homemade Norwegian cream cakes whilst you watch the birds and squirrels. Andersons Restaurant. Boat of Garten. Delicious home made local produce food. Sit in or take away scrumptious fish, chips and more. Sit in or take away.